SOUR POWER® PINK LEMONADE STRAWS ARE NOW AVAILABLE IN TUBS! Exciting “PINK LEMONADE” is the newest flavor profile in the SOUR POWER® Straws in Tubs Line! Dorval Trading Co., Ltd. is pleased to announce the introduction of PINK LEMONADE Straws in Tubs. PINK LEMONADE will be joining the other existing flavors of Straws in Tubs, including Watermelon, Strawberry and Green Apple. This new product is ready to ship now! We are particularly excited about adding this wonderfully powerful flavor to our Straws in Tubs line because of the “WOW!” factor it brings, like a sweet & tart glass of PINK LEMONADE! It will really make your lips smack! PINK LEMONADE Straws in Tubs are packed in 200 count tubs, and 12 tubs packed to a case! 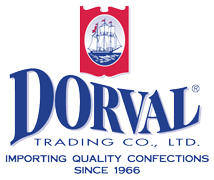 Dorval has continued to develop products that feature the legendary sour taste that kids and adults love. SOUR POWER® is now available in Straws and Belts in wrapped, unwrapped or in bulk format in a variety of package types and flavors.